There’s this one rule we have at my workplace that when you hear it, you’ll think it’s trivial. But when you live by it, you’ll notice not only that others around you don’t follow it nearly enough but also that it really does help lead the path to success. What’s the rule, you ask? Now I know that sounds cheesy and I’m probably coming off sounding like your elementary school guidance counselor that tries to convince the world is full of rainbows and marshmallows – but hear me out. In the pursuit of our dreams, it’s not about faking a smile to the world when we’re having a rough day. But it is about understanding how the right attitude is the first step to making any real changes in our lives. 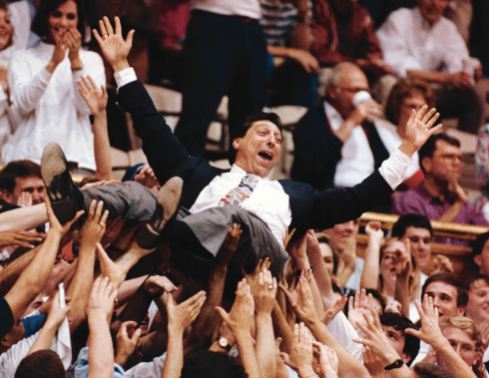 So through the words of Jimmy V, we find another key in the drive toward our dreams. Enthusiasm isn’t just about one smile just like losing weight isn’t about just eating one healthy meal. It’s a series of decisions that become habits you make a point to do every single day…which result in a refreshed, renewed attitude of how you’re going to attain your goals. Suddenly, reaching for your dreams becomes a lifestyle. That is when you need commitment. That is when you need passion. That is when you need the enthusiasm for what your dream or goal means to you no matter how far away it might be feel. Happiness is a mood. Enthusiasm is a mindset.